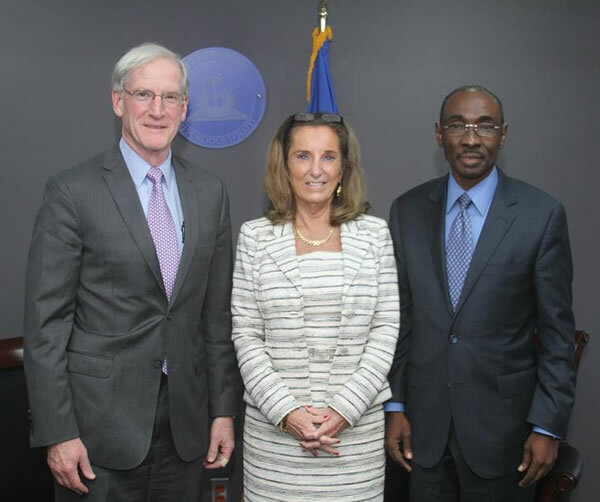 Here is the picture of Haitian Prime Minister Evans Paul with Haiti Special Coordinator Thomas Adams and U.S. Ambassador Pamela White. Prime Minister Paul took a meeting with U.S. State Department Special Coordinator for Haiti, Thomas Adams. The meeting agenda included elections preparation, political party funding, adjustments to the present budget, government corruption, and anti-Martelly protests. Paul emphasized the government's vow to hold fair, honest, and democratic elections. He added the government would finance political parties for inclusion in them. Addressing demonstrations he said government would honor individual freedoms and the right to peaceful assembly.